Robinson’s speech: “We are not frightened by the difficulties; we are not daunted by threats. We will not surrender.” | Bloomsbury Fightback! 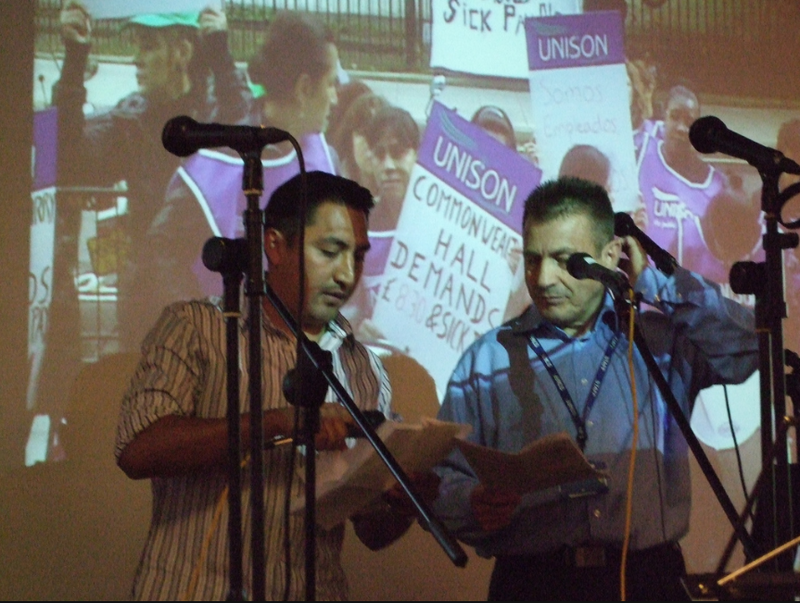 This is the translation of a speech which was given by Robinson, the membership officer of the Senate House Unison branch, at the Fiesta on June 30th 2012, in celebration of the branch’s victory in winning the London Living Wage for all workers. Thank you for coming together and being part of this just cause. Some six years have passed since the beginning of this process and of the possibility of turning our dream into reality; the right time to attempt an evaluation of our progress. As is commonly the case, there are both positive and negative aspects that must be analysed. In the economic sphere, even if things have not developed as expected, we could say our results are not all that bad—after all, we obtained the London Living Wage of £8.30. And that is precisely the reason for today’s celebration, which we wanted to share with all University of London employees and other peers. However, not everything has been rosy; in fact, some years ago, the cleaning companies intensified the difficulties and challenges we must face. At that time we were nearly invisible and the most vulnerable. For those reasons and many others, we must come together to drive the change we want to achieve; if we do nothing, if we do not remain united, we will face more conflict. We are either united, or condemned. We no longer believe in their stories; we are no longer afraid. As I tend to say, we have been cured of fear. It is now time to lay the foundations of our wellbeing—wellbeing like that of many others in this country. We must end the two-tier workforce. We cannot limit ourselves to demanding our rights; we must think that we also have duties. If it is our wellbeing we are concerned with, we must ask ourselves: to what extent do we wish not only to demand our rights but also to play our part in building a better society? It is all about building a culture where everyone understands the collective benefits that working together, instead of waiting for results, will bring. We need to leave aside useless criteria that might undermine the process of change. We all have the duty to participate in this struggle. There must be no excuses when we are talking about our wellbeing and that of our families. I insist: we cannot limit ourselves to being observers. The times are not changing, but we are in times of change. Our struggle will determine the end of an era and the beginning of a new one. For the cleaners and for the union, the challenge is huge. It is about achieving our main demands, which are sick pay, 30-day holiday, and pension. Now, allow me to take advantage of the stage to present two ideas. Firstly, we are the workforce. We can put together our own cleaning company in the University of London instead of wandering around looking for work. Using our knowledge, skills and capabilities, we can generate jobs to produce the wealth that will help us out of poverty, dependency and backwardness. The second idea is to put an end to outsourcing and to bring our contracts back in house. What could we gain from this? Put simply, to receive the same treatment as other University of London employees. We need to promote the desire for change, equity and justice. The road to revolutionary transformation has never, anywhere, been easy. On the contrary. For that reason our commitment grows with every challenge or obstacle. The present is a time for struggle; the future is ours. Let’s also remember that we have received messages of support from many social organizations in the country, which have stated total support to our goal: a change that helps the most vulnerable in society and in the workplace. We live in a world of deep social injustice; we shall not quit our pursuit of these goals. In the crucible of our daily struggle, our word shall be backed up by daily practice, as Simon Bolivar and Eloy Alfaro taught us. We have committed our life and honour in this endeavour, because we are sure of the real possibility of making our dreams come true. We are not frightened by the difficulties; we are not daunted by threats. We will not surrender. By the moral of Judas, who accepts coins from his opponent, we will never build better days. When the campaign started, almost a year ago, only one cleaner was a union member. Today, we are over 120 members, we have a union recognized by the cleaning company, we have structured a little English school for the cleaners, and, most importantly, we have lost all fear. My tribute goes out to our female peers, true warriors who have worn the trousers on our behalf. Many are single mothers who work up to 10 or 12 hours a day and look after their children, and yet they have still found the time to make our dreams come true. « Fiesta! June 30th, SOAS: End the Two-Tier Workforce in Bloomsbury!